Hi, I am interested in your 1993 Jaguar XJS (stock #5032-CHA) listed on Autotrader for $13,995. I'd like to get more information about this vehicle and confirm its availability. 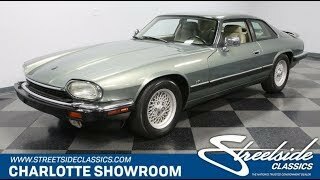 This long, low, and wide 1993 Jaguar XJS coupe proves that a great design is timeless. Even 25+ years after it came off the ship from England, a well-respected life means this still looks like it should cost thousands $$$$ more than it does. The later years are arguably the best for the XJS. The styling was allowed to mature, and the European-style headlights were finally added to give them a truly distinctive look. The long hood and the low-slung body were subtle hints at the companys sporting history. Plus, this earns its elegance in the details, like the flying buttress roof and the 15-inch lattice wheels. The Jade Green Mica paint still retains a terrific factory shine a sign that this Jaguar has been treated with respect for the last 26 years. In fact, averaging only 2,400 miles annually means this is a special occasions kind of car. Jaguars are one of the finest at blending old-world craftsmanship and top-grade materials. You see it on the taupe leather seats and real wood dash and center console. When you slip behind the wheel, you get big gauges, and the gear shift feels substantial in your hand. As expected from a car of this caliber there are plenty of desirable features, including a power front seats, power windows, power locks, driver airbag, heated seats, an anti-theft system, and the factory AM/FM/cassette stereo. Plus, R134a air conditioning keeps this luxury interior at your ideal comfort temperature. By 1993, the new 4.0-liter inline-six was the engine of choice because this fuel-injected multi-valve DOHC provided this car with the most advanced and refined power plant of the series. This original motor looks great in the engine bay, like many of the legendary long Jaguar blocks before it. The motor was shared with the XJ6 of the day, and the four-speed automatic transmission w/overdrive is borrowed from General Motors. This means you can maintain your levels of driving quality for decades to come without breaking the bank. But what really will attract you to this Jag is the feeling you get on the open road. The XJS runs on a fully independent suspension that has been built to balance luxury cruising with spirited driving. In fact, the famous Jaguar rear end has the rear disc brakes inboard for better weight distribution. Plus, theres also power steering, cruise control, and modern Toyo tires to really enjoy the grand tour. Complete with the original warranty card and owners manual, its time to demand the finest from life even if you only have to pay a pittance. Call now!